Welcoming Devaki devi dasi to Toronto - June 1-9, 2016 ~ The Toronto Hare Krishna Temple! From June 1-9, 2016, the Toronto Hare Krishna community will be welcoming Devaki devi dasi for the first time! Devaki Devi Dasi was born in Germany in 1958 and, after a long search and journey, joined ISKCON in Sydney, Australia in 1985. She spent four years in the Sydney temple learning the basics of devotional life. She took initiation from Bhavananda Prabhu and later re-initiation from Prabhavisnu Prabhu. She is now a disciple of Niranjana Swami. During her ten years in married life (1989-1999) she did outreach in Riga, Latvia and spent adventurous years in helping to pioneer the first more organised temple in the former Soviet Union. In 1999, she became a renounced traveling preacher. For the last sixteen years she has been regularly visiting Ukraine, Moldova, Sweden, Germany, Nepal, India and Bangladesh. For some months per year during twenty years she was also collecting funds for the development of various projects and holy places in Nepal and Bangladesh. She is now very actively involved in the IYF Student Preaching in Bangladesh, conducting seminars and IYF festivals under the expert guidance of Bhakti Purusottama Swami. She cultivates the mood of a "Bengali mother" and in so doing tries to create an atmosphere conducive for devotees to be happy in their services by encouraging them to develop their bhakti to their hearts content and by encouraging the men to become good leaders. During her years of service in Bangladesh she developed deep insights into Vaisnava culture that have enriched her spiritual practice and inspired her preaching. She is sharing this wisdom in the course "Exploring the Roots of Spiritual Culture". In Ukraine she has served under the expert guidance of Niranjana Swami, spreading the culture of care for the past fifteen years: on a personal level by serving as a spiritual guide and mentor to many devotees, by assisting devotees to become a spiritual guide themselves, and by lecturing and conducting seminars. She helped establish Bhakti Sangam Festivals in Bangladesh, Nepal and Sweden and is regularly conducting Holy Name Retreats in Ukraine, Moldova, Sweden, Germany, Bangladesh and Ekachakra. 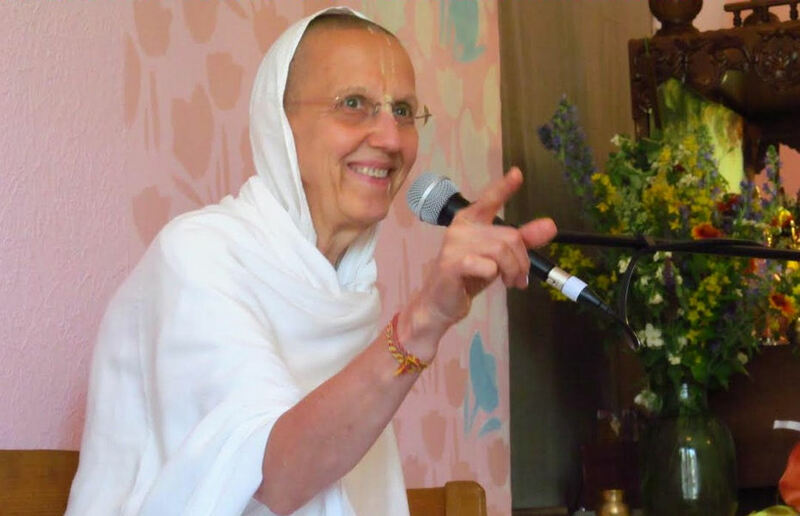 She was serving for several years as a member of the GBC Committee for Devotee Care and promotes spiritual care of every ISKCON devotee to the highest level of priority in our movement. In March 2014 she established the Institute for Spiritual Culture.